Make almost any dessert instantly more scrumptious with our Cream Cheese Sauce. From fresh berries to cake slices, Cream Cheese Sauce gets the job done. Serve immediately. Or, cover and refrigerate until ready to use. Savor every bite of this tasty sauce, but watch your portion size. 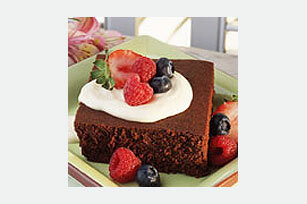 Serve spooned over fresh berries or chocolate cake slices.